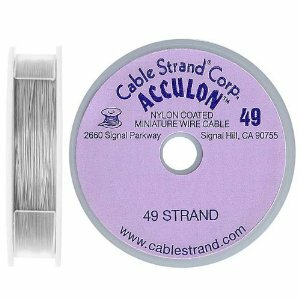 Beading Arts: Giveaway: Acculon 21 and 49 strand beading wire! Long known as an inexpensive beading wire easily available almost everywhere beading supplies are sold, Acculon by Cable Strand has now gotten into the quality beading wire game. I've had a chance to test it out for myself: I received spools of nylon coated Acculon in the medium diameter wire (0.018 inch) in both 21 strand and 49 strand. I thought it compared very favorably to other premium beading wires, and I used it in one of my recent projects that I shared with you (Bali Hai necklace). Would you like to try this wire out for yourself? I've got one 30 foot spool of 21 strand and one of 49 strand to give away. There will be two winners, each receiving one spool of wire (random assignment who gets which). Just leave me a comment below and you'll automatically be entered. If you tweet or post on Facebook or other social spots about the contest, you can leave a second comment and be entered twice! Please please please make sure that your link will lead me to an email address, or else I won't be able to contact you. No contact, no win, and I simply have to go on to the next person. Deadline: November 24, 2010. First of all I make you my compliments for the blog, and very instructive and ello! Bali Hai necklace is gorgeous. I have never tried this wire, but would love to experience it ! The wire sounds great! I would love to win! I have been bead stringing for 35 years starting with fishing line then tiger tail now now softflex and beadalon. Strangely enough I have never used Acculon. It would be a more than welcome addition to my stringing supplies so I would love to win it. I love your blog too! I would love to try this wire. Thanks for your blog! I also facebooked about this giveaway. I just now found your blog! Wonderful, and a giveaway, too! I forgot to leave my e-mail! I do want to try that Acculon. mouski7@yahoo.com. Just discovered your blog thanks to Andrew Thornton's link! Love it and will return often. Appreciate the opportunity for another give-away! love the blog and love the giveaways! I've just started beading so this wire would be great to try out. I tweeted the giveaway with a link.